No shipping, no sales tax, just music! One Feather Shy is also available at iTunes. Excerpts from all 18 songs on One Feather Shy. If you have flash, you'll see the flash music player. Loren Claypool is a West Virginia-based multi-instrumentalist/composer. He plays acoustic, electric, baritone electric, fretless electric, lap steel, baritone lap steel, touch and synthesizer guitars. Loren composes, arranges, loops, improvises, and manipulates sounds across genre boundaries as diverse as progressive, ambient, Guitar Craft-style acoustic ensemble, and spaghetti western. The common thread is guitar as the basis for his instrumental music. His album One Feather Shy can be ordered here! Our flash player has 30 second excerpts of all 18 songs available for your listening pleasure. The description "genre-indifferent instrumental guitar music" is appropriate for this work, as Loren crosses musical boundaries with little regard for convention. Sometimes delicate, sometimes aggressive, the music is textural, visual, thoughtful, and emotional. Moving from sparse arrangements to densely orchestrated compositions, each song is fascinating on its own, but clearly an integral part of a larger work. One Feather Shy is as diverse tonally as it is musically. Loren is fascinated with the sounds that can be made with the instruments he plays. He is just as likely to ferociously manipulate a guitar's sound, as he is to preserve the traditional tone of the instrument. The result is a unique sonic approach to instrumental guitar music. And, on this recording, it's all guitar. Loren is currently at work on new music. In addition to his solo work, he has worked with Guitar Circle of Chicago, a group of musicians committed to working with the principles of Guitar Craft as a "way of doing things." Guitar Circle of Chicago performs throughout the Midwest, featuring songs from the Guitar Craft repertoire, original material, circulations, and improvisations. Loren has contributed to an upcoming project by Lee Fletcher in the UK. He was asked by Markus Reuter of the German experimental duo Centrozoon to provide audio commentary for their CD Lovefield. The result, described by Mr. Reuter as "a piece of art," is available as a download on the band's website. He also contributed spoken word to the UK-based Will Cruttenden Spingere album Recall. Loren is an endorsing artist for Industrial Guitars. 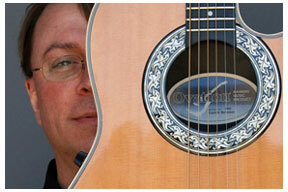 Loren currently resides in Charleston, West Virginia, USA with his family and a lot of guitars. 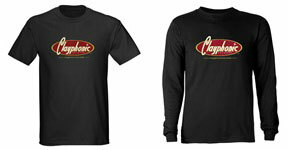 Yeah, you'd look awesome in a Clayphonic Records™ short-sleeve or long-sleeve t-shirt and you know it. We've got black, blue, and grey shirts from small to 3XL. Click here or on the t-shirts to visit our swag store and buy what you need to style up! What are other recording musicians saying about Loren's music? "I really, really enjoyed your CD...congrats on a great release. Really unique background textures and compositions." "Your cd is great and we're happy to recommend it, will keep doing so!" "Beautiful, beautiful, beautiful. Stunningly emotive aural sculptures that ebb and flow and carry the listener on through Loren's very personal journey. I hear moments of Crimson, Zappa, Keneally, Hedges, Legg and maybe even a tad of Keola Beamer."